I was listening to the 7/23/17 radio show and learned that you can also use the black walnuts to remove evil people and their influences from you. I had seen LM black walnuts in a local store and thought they looked really powerful. Sweet Gum Balls (Pods) - miss cat will you consider selling these in the shop? 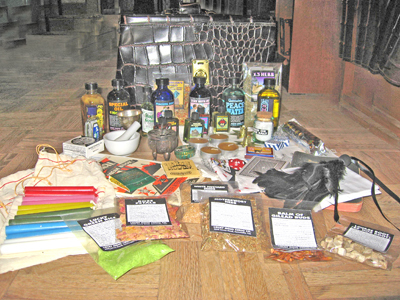 Just noticed a new listing for Money Herbs Mixture - Seven Herbs. Contains 7 herbs alleged to bring abudance and wealth. You could always re-dress yourself with the oils or their sachet powders if you have them. I got my adorable bottle of 4711 today. For me it is similar to Hoyt's cologne and Florida water when it first goes on. (A lemony Hoyt's) After it mellows out it is a little similar to the Peruvian version of Florida water. It smells Lucky. What is the scent of the 4711 eau de cologne? Is it used for luck or more like florida water? Lucky Mojo is selling a mini bottle of this online now. Just wanted to add concerning the boyfriend, use one of bills (paper money) that he gives you as a petition paper. And when you are around him wear Cleo May as a perfume. I received request for admissions, interrogatories, and request for production concerning old credit card debt. How should I dress the papers for some leniency? Mamabird, Blessing would be a nice oil for general blessing. Healing could be used when she is not feeling well. Both those oils smell really good. Tranquility would be good if she is restless. I do not have this one but I am sure that it smells nice. Mamabird, you may want to add some Cleo May to your work. That's supposed to help with frugal husbands. Yeah, looks like the new Blockbuster line is in the process of being put online today. On today's show (February 2nd) they discussed hands on healing. Just wanted to give a plug for the Old Indian Rubbing Oil. It is great for aches and pains. It has saved me many times.